Y., a young mother of twin girls (5) and an infant, was deserted by her husband when she was diagnosed with advanced breast cancer. He left Y. with a mountain of debt as well. Her family cannot help as her father is very ill with leukemia. Y. will have surgery after she completes intensive chemotherapy (to shrink her tumor.) She needs assistance with basic cost of living expenses as well as childcare and household help. Lemonade Fund grant awarded. A. is a 64 year old artist from the south who continued to work despite being challenged by mental illness. She was recently diagnosed with stage 4 breast cancer which has spread to her bones. Her husband has had to return from his job abroad to help care for her and the family is struggling, currently living on National Insurance Institute (Bituach Leumi) subsidies alone. Lemonade Fund grant awarded. S., 55, requested help (through her social worker,) with moving costs to move out of her small basement apartment. She had uterine cancer in 2008 and was just diagnosed with stage 4 breast cancer. The apartment is dank and tiny and she feels that moving to a brighter apartment will help her immensely. Outlook can be everything when faced with a serious disease. Lemonade Fund grant awarded. Thank you, and sending out wishes for happy holidays! איני יודעת את שמך , ואולי גם לא אדע מעולם . אבל כנראה שלפעמים גם אין צורך להכיר כדי לדעת שהנשמה טהורה . אולי כי הם רואים רק את הטוב . תודה שעזרת בסתר , בשקט ובלי לשאול שאלות . זה כל כך לא מובן מאליו וזה כל כך ראוי להערכה . תודה שהעלית לי חיוך רחב בכל המערבולת הזאת של חיי . I do not know your name, maybe I will never know. But sometimes it seems there is no know, just need to know that there are pure souls. Even if you don’t know them. Thanking you for bringing a wide smile to my face in this vortex that is my life. I., 42, diagnosed from the start with Stage 4 breast cancer. Upon diagnosis, husband abandons her with 3 small children, no support. She had a decent job prior to her diagnosis, but now can no longer work full time, and any savings are going to upkeep and legal fees. Sent her a Lemonade Fund grant as well as a supplemental grocery money grant designated by Myisrael for our applicants with young children. S., a retiree living on a small pension, with a history of colon cancer, diabetes, high blood pressure and depression, needs money for transport to chemo treatments. A., 53, from Uzbekistan, lives with her mother (just dx with melanoma,) daughter (just divorced,) and infant granddaughter. Stage 3 diagnosis. Family needs help until National Health Insurance payments come in. 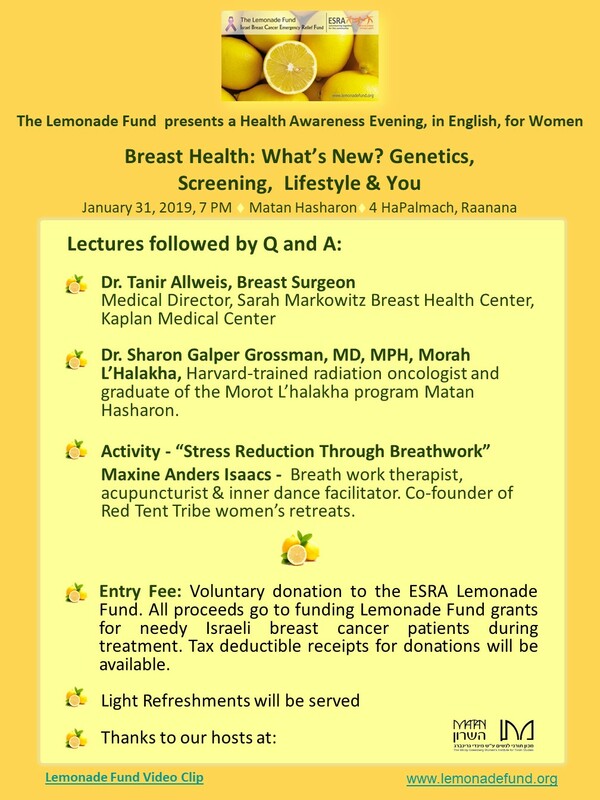 The Lemonade Fund is now helping Israeli breast cancer patients across the land. Our average grant is NIS 2,100 ($580.) This amount can make all the difference to a patient while they are going through treatment. In dealing with this illness economic difficulties can put a dark cloud over one’s feeling of repose. A Thank You letter from a recent Lemonade Fund grant recipient. I would like to thank you for the generous grant which you authorized for me unexpectedly and within such a short time. You are the only ones and the first to help me in this difficult situation, as a single mother, who within a month and a half of being diagnosed with the illness, was about to undergo surgery and leave my seven year old without me at home, with no help or assistance from anyone. I was so overcome to see the grant in my bank account, for me it is like a gift from heaven, so pleasing, and it is so supporting and encouraging to know that someone cares. I feel that I am no longer alone in the world, at this dramatic and critical moment in my life. Thank you very much. It really gives me hope and strength to continue. היחידים והראשונים שעזרו לי במצב הלא פשוט הזה, כאם חד הורית, שבתוך חודש וחצי מגילוי המחלה, עומדת להיכנס לניתוח ולעזוב בית עם ילד בן 7 כשאין שום סיוע או עזרה מאף אחד. כאשר נטל פיננסי של חולה בסרטן נופל על הילדים – דצמבר 2018. ר., בת 55, מירושלים סובלת מבעיות פסיכיאטריות (עברה מספר אשפוזים), שבר ברגל ובשלב זה – סרטן השד. היא עברה לאחרונה כריתת שד והיא עומדת להתחיל בטיפול כימותרפי, למרות היותה מרותקת למיטה. ביתה בת ה -30 (בהיריון עם ילדתה השלישית) עובדת במשרה מלאה (משכורת של 3000 שקל לחודש), והיא היחידה שמטפלת באמא שלה, על כל ענייניה הבריאותיים וכספיים. ר. שקועה עמוק בחובות. היא מקבלת קצבת נכות צנועה וסיוע בדמי שכירות. עם זאת, כל ההוצאות הנוספות שהבת נושאת (הוצאות שנגרמו בגלל מחלתה של אימה), כגון עלויות נסיעות ושמרטפות, היעדרות מעבודתה – אינן מכוסות. תהליך הגשת בקשה לסיוע מקרן לימונדה, בסיוע העובדים הסוציאליים בבית החולים, מאפשר לנו לקבל תמונת מצב משפחתי של המטופלת. כולנו מודעים לעובדה אבחנה של סרטן משפיעה על כל המשפחה. במקרים מסוימים המטפלים סובלים מעומס יתר והם זקוקים לסיוע כספי כדי לא לקרוס! קרן לימונדה כאן לעזור לחולים אלה וכן למשפחותיהם. When the Financial Burden of a Parent’s Cancer Falls on the Children – December 2018. R., age 55, from Jerusalem has psychiatric problems (several hospitalizations,) a broken leg and now, breast cancer. She recently underwent a mastectomy and is about to start chemotherapy, despite being currently bedridden. Her 30 year-old daughter (pregnant with her third child,) works full-time (NIS 3000/month salary,) and is the sole caretaker for her mother, for all of her health and financial affairs. R. is deeply in debt and gets by with a small disability check and rental assistance. However, all of the daughter’s extra expenses (caused by her mother’s illness,) such as transportation and babysitting costs, time lost from work, are not covered. The Lemonade Fund application process, aided by hospital social workers, allows us to get a picture of the patient’s family situation. We all know that cancer impacts an entire family. In some cases, the caretakers are overburdened and need financial help badly so they don’t crash! The Lemonade Fund is here for these patients and their families. C, a 20 year old soldier from the center of the country, was weeks away from completing her army service when she felt a lump in her breast. While her friends were planning post-army trips or applying to university, C. was preparing for chemotherapy. C. turned to the Lemonade Fund for financial help because she had expenses caused by her illness and her family is destitute and couldn’t help her. During her army service, C. had permission to work part time outside of the army so that she could contribute income to her family. Now, in addition to being unable to work and help her family, C. needs help herself. The Lemonade Fund grant will provide C. with money to cover transportation to treatment costs, specialty clothing and most importantly to a such a young woman, a wig that matches her real hair. We wish C. a full recovery and a return to the normal life of a young adult. R., a retired teacher, originally from the former Soviet Union, has experienced two tragedies in the last few years. Four years ago her daughter died of ovarian cancer, and then her husband died suddenly on the day of her diagnosis with breast cancer. To make matters worse, she is responsible for the care of her surviving son who has mental health problems and lives with her. R. is still reeling from the losses she has suffered, and she is also finding it hard to manage on her small pension and her son’s disability benefits. R.’s social worker submitted an application to the Lemonade Fund on R.’s behalf, and we hope that her Lemonade Fund grant sends her a message of our support, financially as well as emotionally. These are the stories of two of the applicants from September. This past month we had a steep increase in the number of applications and we appreciate your continued support so that we can keep helping Israeli breast cancer patients who are in financial distress. A reminder that October is Breast Cancer Awareness month. Here is a lemony graphic to help you be alert to the possible signs of breast cancer. Early diagnosis can help save lives. The first day of Breast Cancer Awareness Month, October 1, coincides with the last day of the cycle of Jewish holidays this year, (the Jewish New Year, Yom Kippur and the festival of Sukkot.) There is a connection here that is worth noting. It is customary to read the book of Ecclesiastes, Solomon’s deeply philosophical and personal tome, on Sukkot. King Solomon is writing at the end of his life, about what, after a lifetime of wealth and fame, really matters. This verse is understood as a an urging to give charity to strangers, those whom one might never meet. The generosity will be repaid, the giver rewarded. The cycle of Jewish holidays ends a period of reflection and judgement. Next week we will all return to our routines and officially begin our year. It is important to realize what gift NORMALCY is. lost income due to treatments and dr visits. emergency financial assistance while awaiting national benefits. The Lemonade Fund sends final wishes for a good new year. At the same time we urge all women (and men at risk, 1% of breast cancers occur in men!) to schedule their yearly breast screening.